Hello. My name is Lilac. I am as pretty and sweet as my name. 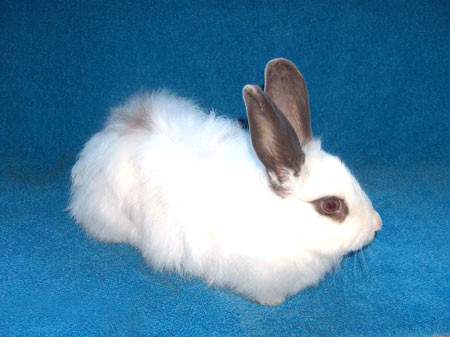 My "pedigree" is probably an exotic mix of a Jersey Wooley or Angora rabbit and a fine-boned bunny. I'm very delicate and feminine looking. My fur is soft and wispy and will need regular grooming to keep me looking pretty and feeling healthy. My eyes are a steel blue-gray matching my ears and the spots on my body. I'm quite lovely and also a very gentle, loving and sweet rabbit. I am a bit shy at first, but that's because I am such a little princess and proper lady. I a enjoy being with people and will be a wonderful friend for you.